Riding the Tube with Vita Sackville-West. Today is the first day of Virago reading week being hosted by Rachel and Carolyn. It seems appropriate to kick-off my participation by writing about the first Virago I ever read. In 1992 I lived within walking distance of Charing Cross Road and the myriad bookshops on, and adjacent to, that famed stretch of book lovers’ London. I was certainly bookish back then, but two things conspired to keep me out of those shops. The first was that I had no money to buy books. I made just over 500 pounds a month and most of that went to housing, food, and transport. What little money I had left over I would use to buy tickets for concerts at the South Bank Centre and a season ticket to the Proms. The second was that I was 21 years old and living in a hostel with 27 other people my age. Who had time to spend in bookshops when there were all those hormones flying around? That doesn’t mean I never went into them. Just not as often as I would today if given the same proximity. One day while combing through the cheapish paperbacks in the basement of the old Quinto Bookshop I came across All Passion Spent by Vita Sackville-West in a Virago Modern Classics edition. I don’t remember why I chose it, but I do remember very vividly reading it. There is a scene in the book where the protagonist, Lady Slane is making her way to Hampstead on the Northern Line of the Underground. The narrative intersperses her progress on the Tube with her thought process. Paragraphs of text are separated by indications of which stop the train is passing through as she thinks each thought. The reason I remember this so clearly is because as I read it, I was also on the Northern Line–passing through the very same stations the fictional Lady Slane had passed through 70 years earlier (Tottenham Court Road, Goodge Street, Warren Street, etc.). The novel is the quiet, lovely, somewhat joyful and melancholy story of Lady Slane being independent–emancipated by the death of her husband–at the ripe age of 88. 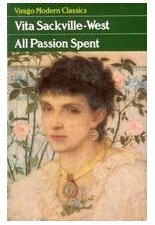 I thoroughly enjoyed reading All Passion Spent. It was a type of novel that I hadn’t really encountered before. And the back cover of the green banded Virago edition suggested that there were legions of similar works by women authors just waiting for me. Over the years I picked them up here and there, but it wasn’t until into my 30s that I really began to appreciate the niche that Virago filled. I am no expert on Virago, but it seemed like there was a time when they focused on out of print, hard to find works. But today it seems they even publish the likes of Margaret Atwood. So that niche, if indeed it ever was exclusively their focus, seems not to be as tightly focused as I originally thought. Since Viragos, especially newer editions, aren’t really sold new in the US, I am unlikely to become a devotee of their newer offerings. I am happy to maintain, however, my interest in their older titles. This probably explains why I remain equally devoted to their older cover designs, but more on that later in the week. 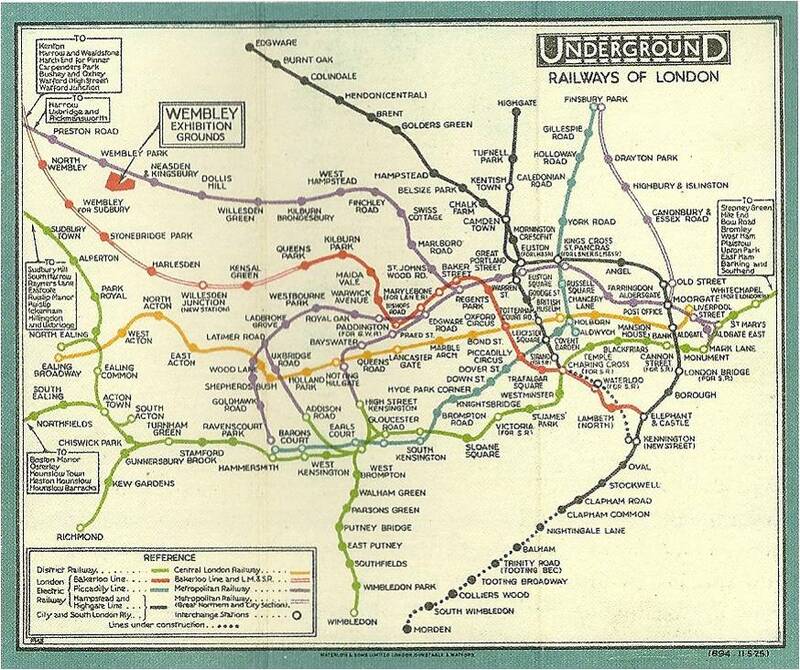 Interesting to note that the first version of the now iconic diagrammatic map of the London Underground was created by Harry Beck in 1931, the same year All Passion Spent was published. This means that Lady Slane would have been looking at a map quite different from the one I looked at in 1992.
lettering was unusual for the Underground which had been using the iconic Johnston sans serif typeface since 1916.
easier to read. The use of the more common Johnston typeface also improves clarity. This is probably the map that Lady Slane would have consulted in 1931.
adherence to north/south/east/west and the Thames is highly stylized to maximize legibility. hundreds of less than perfect adaptations in other cities as well as frequent references in popular culture. I *think* that Virago have published Margaret Atwood from the outset, that they have always been her UK publisher. Along with other feminist writers of her generation her work would have been instrumental in their inception (Angela Carter was also heavily involved). I had a similar tube reading experience a few years ago while visiting London. I bought Neverwhere by Neil Gaiman from Foyles & started to read it on tube; it's partially set in a subterranean London and I read a passage about St John's Wood as I was passing through St John's Wood (travelling north on the Jubilee). I've had All Passion Spent standing on my shelf unread for years but you have me itching to pick it up. Wow. I'm amazed at how “modern” these 80 + year old maps look. What a fun book experience, too. Thanks for the review (and the education on the London Underground). Do you think a bookshop would exchange books for work? I can't imagine how difficult it must have been for you to be around so many fabulous bookshops with little money to spare. It's tragic is what it is! My B&B is on Gower so I loved your mention of the Northern Line. I love how this went from a discussion about Virago to a discussion about the changing format of the tube map! Wonderful! I have All Passion Spent boxed up at my mum's and am now regretting that I never picked it up when I had the chance. I love the tube map. It makes so much more sense than the silly Manhattan one. It's funny to look at the old versions and see what stations have appeared and disappeared over the decades. What a lovely bit of nostalgia! As Claire mentioned, Virago were Margaret Atwood's first publisher. I think they started out with several different lists and then over time most of their books merged into the VMC banner. Claire: I had a feeling that Virago did current titles, but my personal experience has been limited to the older titles they have published. How odd that you too had a tube reading coincidence as well. The only other book I remember reading on the Tube specifically is On the Road by Jack Kerouac. I remember it because I really didn't like it but I appreciated its soporific effects on me. Susan: Good design can last a long time. Darlene: Thankfully my 21-year old life and the Holborn branch library kept me from feeling the need to buy books. Plus my book acquistion muscle wasn't what it is now. Rachel: You are right about the Manhattan map. It is so crazy and impossible to know all of the many, many exceptions about off peak trains, and expresses and weekends and the million other things they try to convey. What a fun post! 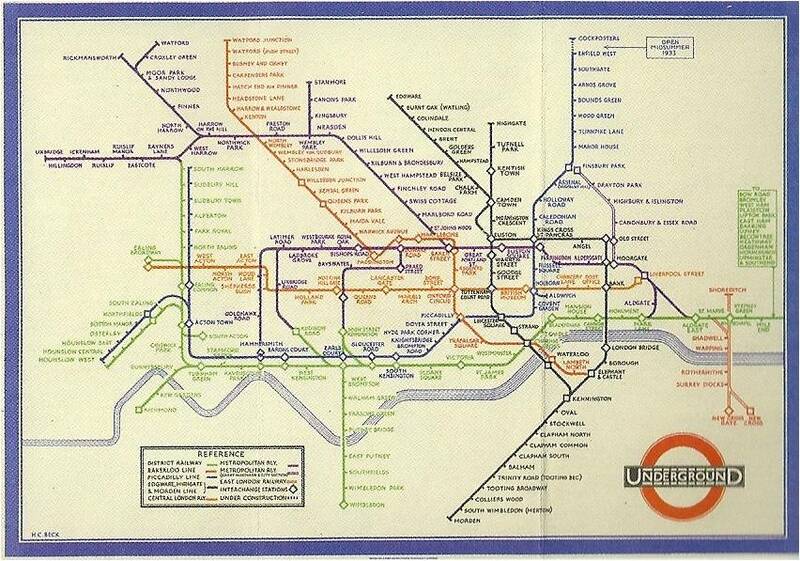 I adored All Passion Spent, and I'm a complete map geek so I really enjoyed seeing the evolution of tube maps. Loved this post! My daughter, studying in London, just mentioned Quinto Bookshop today… she had a good browse. I really want to go read All Passion Spent now. I enjoyed The Edwardians and I can't wait to read more Sackville-West. I think I read this exactly a year ago and fell in love! What a wonderful experience with you reading while the stops go by, I love those moments. All Passion Spent is one of the books where I imagine becoming director and re-do the film. I would of course cast the British greats: Helen Mirren, Judi Dench, Maggie Smith, etc. as her children, but I'm always stumped with who to cast as Lady Slane? Any (living) suggestions? I thought Angela Lansbury, but then no, I can't see it. Laura: I am a map geek myself. Especially when they deal with transit. Verity: I have been to the LTM many times. I must say though, I with they had an advanced version for adults that was quieter and went into more depth. JoAnn: Are you having fun living vicariously through your daughter? Are you going to visit her? Amanda: I think you would love it. Daniel: At 81, I think Joan Plowright could be Lady Slane. I also think Maggie Smith could get away with playing Lady Slane even though she is only 76. I have a hard time taking Angela Landsbury seriously. Great post – I love this sort of book-nostalgia. 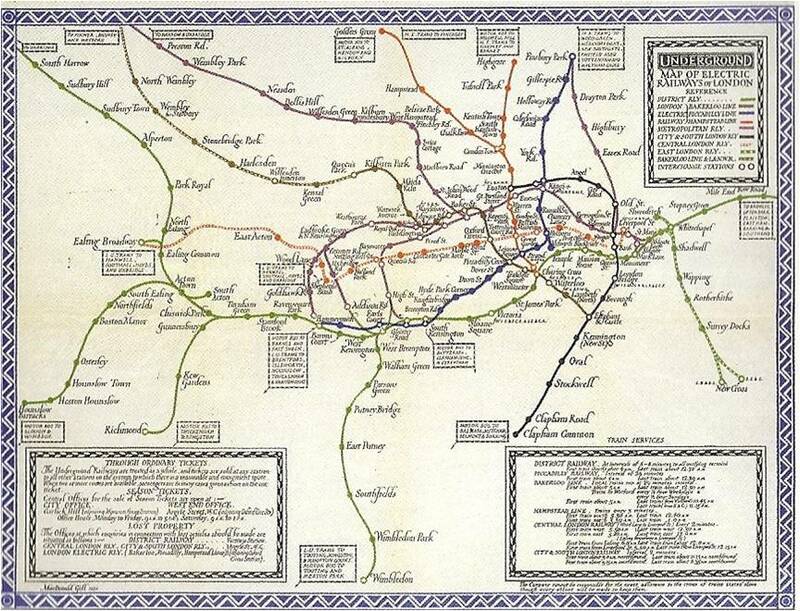 And I also love those early Tube maps; not seen them before.